Why Are Cherry Hemangiomas Spots Red? Are you seeing spots? Not the kind in your eyes, but little, red spots on different areas of your body? Maybe there were one or two that you first noticed a year or two ago, but now there are 20, 30 or more everywhere on your scalp, neck, chest, tummy or back? It’s OK, don’t get too worried! 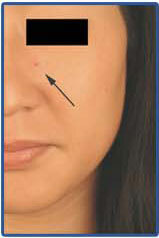 These are most likely cherry angiomas which are little, bright red growths that are very near or on the skin’s surface. They are completely benign (and normal) skin growths that are made up of lots of microscopic blood vessels. No one is really quite sure why people get these little spots, but they can show up anywhere (although they’re usually on the trunk) and affect both men and women of any race or ethnicity. They do discriminate in one area though: they often start in adulthood and get worse with age! While they don’t bother some people who have them, they can really be a cosmetic concern for others. And Celibre Medical Corporation has a solution if you’re one of those people who wants to get rid of your cherry angiomas. 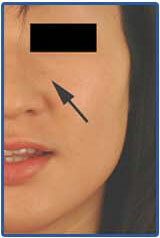 We offer effective treatment of cherry angiomas using cauterization with a hyfrecator. During treatment with the hyfrecator, the heat energy is transferred to the blood vessel walls causing them to shut down and not carry blood anymore. After treatment and over time, these unused vessels are reabsorbed by the body and the spots disappear. Come in and see us if you’re ready to get rid of your cherry angiomas. One of our experts can tell you if that is indeed what’s got you seeing spots and make a plan to use one of our state-of-the-art treatments to help make your skin clear again. We would love to give you a free consultation in either of our Los Angeles or Orange County offices, so please give us a call today to schedule!